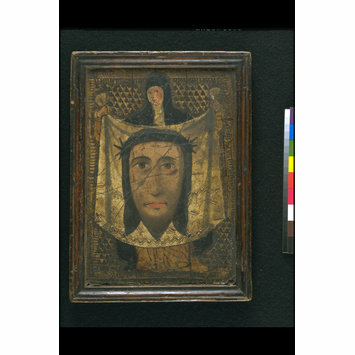 Painted gilt leather panel, in its original wooden frame, with the representation of St. Veronica holding the Vernicle. Painted in various colours, and punched with four different stamps. Gift from Dr.W. L. Hildburgh F.S.A, Hotel Rembrandt, Thurloe Place SW., RP23/7581. Purchased by the donor at Barcelona. - Coll. Colomer-Munmany, Vic (Sp. ), inventory numbers 538, C/838; 460, C/810; 464, C/814. - Museo des Artes Decorativos, Madrid (Sp. ), inventory numbers unknown (two panels) - Posada del Potro, Cordoba (Sp. ), inventory number 18. 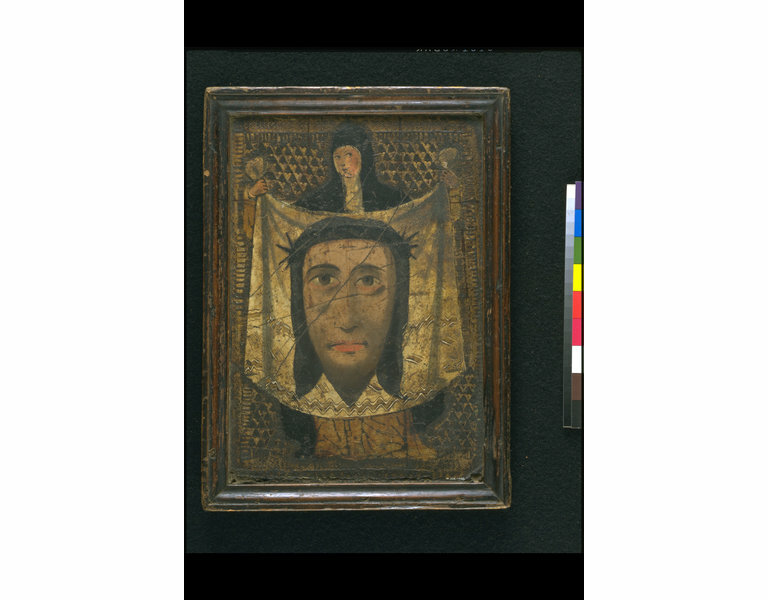 This panel has been analysed as part of the gilt leather cataloguing project in 1996. Report prepared by Christopher Calnan, Adviser on Conservation of Organic Materials at the National Trust, London. Examination of vegetable tannins carried out by Jan Wouters, KIK, Brussels. 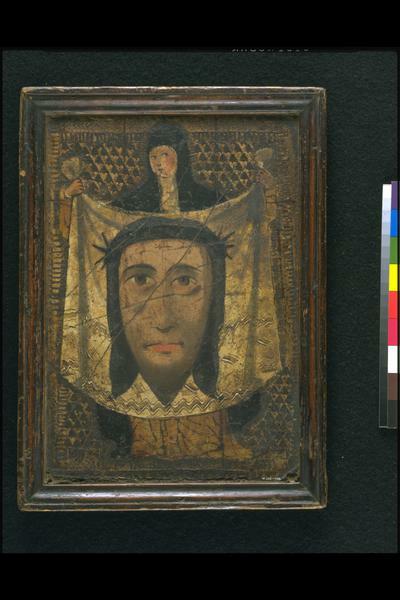 Painted gilt leather panel, in its original wooden frame, with the representation of St. Veronica holding the Vernicle. Painted in various colours, Spain, ca. 1600-1800.